Cite this article: Mengyue, L., & Zhuoran, L. (2019). A Survey on the Out-of-school Children in Shaanxi, China. International Journal of Arts and Commerce, 8(2), 29-36. The problem of dropping out of school is a common and urgent problem facing the whole world, which is of great significance to the universal education of the whole society. 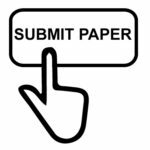 Taking the out-of-school adolescents in Shaanxi Province as the research subject, this paper is conducting a survey on the current situation of dropping-out children in Shaanxi, China via questionnaire. Following it, the causes of out-of-school is analyzed. The aim is to provide policy decision-making basis for government departments and eliminating the out-of-school population in all-round way. The problem of dropping out of school is a common and urgent problem facing the whole world. The concern of dropping out of school is a great challenge to universal education, which might be reflected from two aspects: on the one hand, the elimination of school dropout is the goal of Education for All (II), whose goal is to ensure that by 2015, all children, especially girls, disadvantaged children and ethnic minority children, can accept and complete free and high-quality, quantitative compulsory primary education. On the other hand, the number of school dropouts is also an important indicator to measure the process of universal primary education and the goal of universal education. This study will select the out-of-school adolescents in Shaanxi Province as the research subject, investigate the current situation of out-of-school children in Shaanxi Province, China and explore the causes of out-of-school. The author is hoping to offer some insights to government departments to set up relevant policies ant to eliminate the out-of-school population in all-round way. In view of the phenomenon of teenagers’ dropping out of school and the relevant literature and news, this research adopts the method of combining questionnaire with relevant news, and chooses three respective areas of northern, southern and central Shaanxi to conduct an in-depth investigation. At the same time, a questionnaire was designed, including the personal information about the family, the possible reasons why they drop out and their current career situation. The survey results were analyzed and concluded. Research site: Lintong district, Xi’an city, Shaanxi province; Ningqiang county and Mian county, Hanzhong city, Shaanxi province; Baota district, Yan’an City, Shaanxi province. Data sources: questionnaire star and news of past years. Statistical method: sector number proportion statistics. The questionnaire is divided into two parts. The first part is to analyze the family background, reasons of school dropouts and current situation of them. The second part is to study the future career planning of the school dropouts. The results of the survey were as follows. Firstly, the majority of out-of-school adolescents are male youth, accounting for 69.44% of the total number of the surveyed, and a few are female youth, accounting for only 35.56% of the total number of the surveyed. And the total number of these teenagers whose family income is more than 3500 yuan per month is 33, accounting for about 30.56% of the total number surveyed. The monthly income is between 2500 yuan and 3500 yuan, a total of 28 people, accounting for 25.93% of the total survey. The number of people whose monthly income ranges from 1500 yuan to 2500 yuan is the same as the number whose monthly income ranges from 500 yuan to 1500 yuan, totaling 42 people. The proportion was 19.44% of the total. Monthly income of five people is less than 500, accounting for about 4.63% of the total number of surveys. Most teenagers have a monthly income of more than 2,500 yuan to about 3,500 yuan, which is a middle-income family. However, from the average salary of Shaanxi Province over the years to date, the family monthly income of these adolescents is on the low side. It can be seen that there has been a significant change in the high proportion of female dropouts due to the preference for boys over girls. There is no strict positive correlation between the percentage of teenagers dropping out of school and family income. There are many reasons for teenagers dropping out of school, and the education level of these parents is not high. 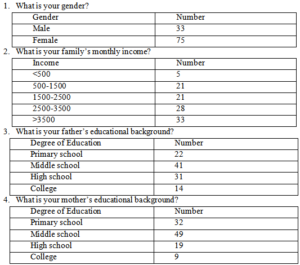 Most teenager fathers have high school and junior high school education, accounting for 28.7% and 37.96% of the total number of surveys, respectively. About one fifth of adolescent’ fathers have primary school education and only a few teenagers’ fathers’ educational level is higher than junior college, accounting for only 12.96% of the total number of surveys. The educational level of mothers of out-of-school adolescents is mostly junior high school and primary school, accounting for 45.37% and 29.63% of the total number of surveys, respectively. A small number of out-of-school adolescents’ mothers’ educational level is at the high school level, and only nine mothers were college or higher educational level. In the process of teenagers’ growth, because the knowledge level of parents is limited, their educational ability to children’s learning concept and enthusiasm is not satisfactory. Parents’ values are easy to influence teenagers’ values and world outlook, so their educational level is related to teenagers’ dropout. According to the survey report, most of the dropouts give up their studies in junior and senior high schools, especially in senior high schools, accounting for more than half of the 108 students, while two-fifths of the junior high school dropouts, and very few of them give up their studies in primary school, accounting for only 7.41%.Thus, it can be seen that in the age composition of the lost scholar, most people already have a complete way of thinking and personal qualities. Moreover, when facing the problems of continuing education, most of the dropouts expressed their willingness to receive education again, which also played a good role in expanding the audience of the dropouts when receiving psychological counseling and career planning assistance. The results of the survey show that nearly 50% of families have no clear attitude towards the situation of teenagers dropping out of school, that is, they do not support or oppose it. Nearly 40% of adolescent families have negative attitudes towards teenagers dropping out of school and only very few adolescent families support and affirm it. It can be seen from this that most parents of the out-of-school adolescents regret that their children drop out of school. According to the statistical chart, the reason why teenagers drop out of school is generally due to their subjective feeling of being tired of learning, family economic emergencies, sudden accidents and other related matters. Thirty percent of the out-of-school teenagers are dissatisfied with the current education and think that the school teachers and teaching facilities are backward, so they give up continuing to study. In addition, 9.26% of the total number of teenagers who dropped out of school due to the ideas of their parents and elders and school violence. About 14% of adolescents choose to give up their studies because of their physical factors. It can be seen from this that most of the reasons for teenagers dropping out of school are because of their own dislike of learning, which also reflects the general psychology of some teenagers in modern society. Therefore, in this period, parents and future generations should strengthen communication with teenagers. Secondly, teenagers dropping out of school are also vulnerable to threats and interference form the outside world, which also reflects the institutional imperfection from the side. School should also strengthen the protection of young people and to minimize and avoid such phenomena. According to the statistical results, 50% of the respondents expressed dissatisfaction with the current living conditions, about 30% of the teenagers did not feel much about their own life, and only 20% of the dropout students expressed satisfaction with the current life. About 61.1% of the dropout students expressed their willingness to participate in and listen to the lectures on life planning, so as to adjust their future self-development. And most of the dropout students have a friendly attitude towards the work introduced by the intermediary company. More than 60% of the youth who are out of school are willing to accept the work introduced by the intermediary company. 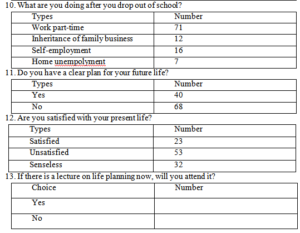 The survey results show that most of the people surveyed are not satisfied with the current living conditions. They want to get better living conditions, learn more knowledge, and have higher requirements for the quality of life. Government can help them improve their living conditions and quality of life and their life satisfaction from many aspects, like training skills, education, job opportunities. For self-employment, 75.93% of the respondents said they had the idea of self-employment. Only 24.07% of the respondents said they had no idea of self-employment. At the same time, 67.6% of the out-of-school youth expressed their willingness to participate in free training on entrepreneurship and innovation, while 32.4% of the out-of-school youth expressed their unwillingness to participate in similar training. According to the report on the current situation of youth entrepreneurship in China, the proportion of College graduates, College students, junior high school graduates and secondary school graduates before entrepreneurship is 26.5%, 12.6% and 5.7%, respectively. The group without working experience accounts for more than 40% of the total sample of entrepreneurship. The proportion of urban unemployed people starting businesses accounts for 18.3% of the total sample. According to the report, 6.0% of entrepreneurs are very familiar with the entrepreneurship policy, 62.7% know something about it, 26.4% do not know much about it, and 4.9% hardly know about it. Most of the respondents enjoyed the entrepreneurship policy, only 15.4% of the respondents did not receive any policy support. In the process of investigation, it is found that the areas of youth entrepreneurship are relatively concentrated, such as college students are more inclined to entrepreneurship in e-commerce, computer technology support and so on, and young farmers are more willing to engage in their own familiar breeding industry. The overall characteristics of young entrepreneurs are as follows: first, there are more males than females; secondly, they are younger, with the average age of starting a business for the first time being 24.67 years old, and the highest entrepreneurial activity among 20-26 years old; third, they have higher education background, with more than 75% of the college students, on-the-job personnel and returnees from abroad being young are the main force of entrepreneurship; fourth, the proportion of people with little experience or no work experience is higher, and the majority of people who start a business for a short time and start a business for the first time (58.9%).